For the Neuroticfish album, see Surimi (album). 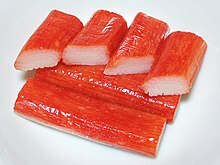 Surimi (Japanese: 擂り身 / すり身, "ground meat") refers to a paste made from fish or other meat. It can also refer to a number of East Asian foods that use that paste as their primary ingredient. It is available in many shapes, forms, and textures, and is often used to mimic the texture and color of the meat of lobster, crab, grilled Japanese eel and other shellfish. The most common surimi product in the Western market is imitation crab meat. Such a product often is sold as krab, imitation crab and mock crab in the United States, and as seafood sticks, crab sticks, fish sticks, seafood highlighter or seafood extender in Commonwealth nations. In Britain, the product is sometimes known as seafood sticks to avoid breaking Trading Standards rules on false advertising. The process for making surimi was developed in many areas of East Asia over several centuries though the exact history and origins of this product are unclear. In China, the food was used to make fish balls (魚蛋/魚丸) and ingredients in a thick soup known as "Geng" (羹) common in Fujian cuisine. In Japan, it is used in the making of numerous kamaboko, fish sausage, or cured surimi products. The industrialized surimi-making process was refined in 1969 by Nishitani Yōsuke of Japan's Hokkaidō Fisheries Experiment Institute to process the increased catch of fish, to revitalize Japan's fish industry, and to make use of what used to be considered "fodder fish". Surimi industrial technology developed by Japan in the early 1960s promoted the growth of the surimi industry. The successful growth of the industry was based on the Alaska pollock (or walleye pollock). Subsequently, production of Alaska pollock surimi declined and was supplemented by surimi production using other species. Two to three million tons of fish from around the world, amounting to 2–3 percent of the world fisheries' supply, are used for the production of surimi and surimi-based products. The United States and Japan are major producers of surimi and surimi-based products. Thailand has become an important producer. China’s role as producer is increasing. Many newcomers to the surimi industry have emerged, including Lithuania, Vietnam, Chile, the Faroe Islands, France, and Malaysia. Lean meat from fish or land animals is first separated or minced. The meat then is rinsed numerous times to eliminate undesirable odors. The result is beaten and pulverized to form a gelatinous paste. 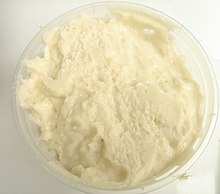 Depending on the desired texture and flavor of the surimi product, the gelatinous paste is mixed with differing proportions of additives such as starch, egg white, salt, vegetable oil, humectants, sorbitol, sugar, soy protein, seasonings, and enhancers such as transglutaminases and monosodium glutamate (MSG). If the surimi is to be packed and frozen, food-grade cryoprotectants are added as preservatives while the meat paste is being mixed. Under most circumstances, surimi is processed immediately into a formed and cured product. Typically the resulting paste, depending on the type of fish and whether it was rinsed in the production process, is tasteless and must be flavored artificially. According to the United States Department of Agriculture National Nutrient Database, fish surimi contains about 76% water, 15% protein, 6.85% carbohydrate, and 0.9% fat. In North America and Europe, surimi also alludes to fish-based products manufactured using this process. A generic term for fish-based surimi in Japanese is "fish-puréed products" (魚肉練り製品 gyoniku neri seihin). Although seen less commonly in Japanese and Western markets, pork surimi (肉漿) is a common product found in a wide array of Chinese foods. The process of making pork surimi is similar to making fish surimi except that leaner cuts of meat are used and rinsing is omitted. Pork surimi is made into pork balls (Chinese: gòngwán; 貢丸) which, when cooked, have a texture similar to fish balls, but are much firmer and denser. Pork surimi also is mixed with flour and water to make a type of dumpling wrapper called "yànpí" (燕皮 or 肉燕皮) that has the similar firm and bouncy texture of cooked surimi. Beef surimi also can be shaped into a ball form to make "beef balls" (牛肉丸). When beef surimi is mixed with chopped beef tendons and formed into balls, "beef tendon balls" (牛筋丸) are produced. Both of these products commonly are used in Chinese hot pot as well as served in Vietnamese "phở". Bakso, made from beef surimi, is a popular common food found in Indonesia. The surimi process also is used to make turkey products. It is used to make turkey burgers, turkey sausage, turkey pastrami, turkey franks, turkey loaf and turkey salami. Surimi is a useful ingredient for producing various kinds of processed foods. It allows a manufacturer to imitate the texture and taste of a more expensive product, such as lobster tail, using a relatively low-cost material. Surimi is an inexpensive source of protein. In Asian cultures, surimi is eaten as a food in its own right and seldom used to imitate other foods. In Japan, fish cakes (kamaboko) and fish sausages, as well as other extruded fish products, are commonly sold as cured surimi. In Chinese cuisine, fish surimi, often called "fish paste", is used directly as stuffing or made into balls. Balls made from lean beef (牛肉丸, lit. "beef ball") and pork surimi often are seen in Chinese cuisine. Fried, steamed, and boiled surimi products also are found commonly in Southeast Asian cuisine. In the West, surimi products usually are imitation seafood products, such as crab, abalone, shrimp, calamari, and scallop. Several companies do produce surimi sausages, luncheon meats, hams, and burgers. Some examples include Salmolux salmon burgers and SeaPak surimi ham, salami, and rolls. A patent was issued for the process of making even higher-quality proteins from fish such as in the making of imitation steak from surimi. Surimi is also used to make kosher imitation shrimp and crabmeat, using only kosher fish such as pollock. The curing of the fish paste is caused by the polymerization of myosin when heated. The species of fish is the most important factor that affects this curing process. Many pelagic fish with higher fat contents lack the needed type of heat-curing myosin and are not used for surimi. Certain kinds of fish, such as the Pacific whiting, cannot form firm surimi without additives such as egg white or potato starch. Before the outbreak of bovine spongiform encephalopathy (BSE, mad cow disease), it was an industrial practice to add bovine blood plasma into the fish paste to help its curing or gel-forming. Today some manufacturers may use a transglutaminase to improve the texture of surimi. Although illegal, the practice of adding borax to fish balls and surimi to heighten the bouncy texture of the fish balls and whiten the product is widespread in Asia. ^ "Nutrient data for 15109, Fish, surimi". National Nutrient Database for Standard Reference. Release 25. United States Department of Agriculture. 9 October 2012. Retrieved 5 May 2013. Jae W. Park, ed. (2005). Surimi and surimi seafood (2nd ed.). Boca Raton, FL: Taylor & Francis. ISBN 978-0-8247-2649-2. Jae W. Park, ed. (2014). Surimi and surimi seafood (3rd ed.). Boca Raton, FL: CRC Press. ISBN 978-1-4398-9857-4. Wikimedia Commons has media related to Surimi.